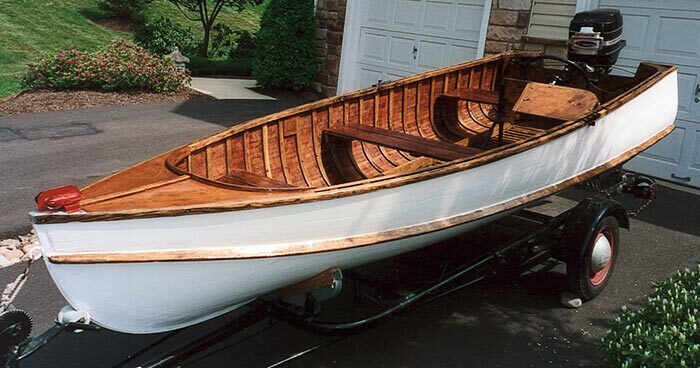 Art Ross writes "Thompson Bros. of Peshtigo, WI, built this TVT Hi-Speed Fish Boat in 1954. She spent the last 30 years residing in an Amish barn. She is 14' LOD, has a 55" beam, and goes real fast with a 1967 Mercury 350. The canvas transom and bottom, mahogany over red spruce, have been restored, and five decades of varnish made to look new. The original ad says that they were very stable, and 'the Hi-Speed Fish Boats were excellent to use when women and children were found to be in the fishing party.' Relaunched in Oxford, MD, she will be used by my wife, Carol, as a prop in her wedding photography business, and occasionally as a launch for our classic sailboat."